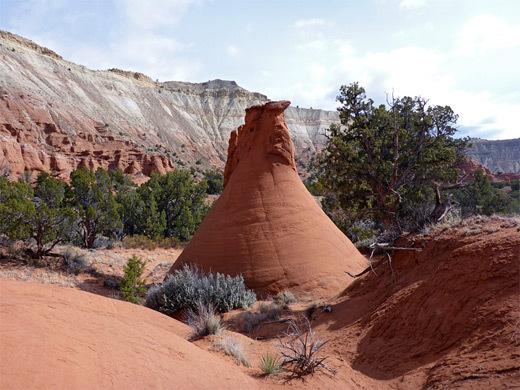 The Panorama Trail is the longest and most varied of the six hiking routes in Kodachrome Basin State Park, crossing flat land on the west side of the park road, to viewpoints, sand pipes, narrow ravines, red cliffs and other Entrada sandstone formations. The total length is 6 miles, round trip, along three connected loops and three spurs, though shorter trips are possible, and most people don't hike the full distance. 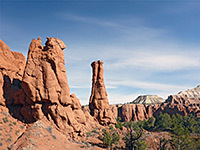 There are six major, named features (see map below); the closest two are Ballerina Spire, a tall, graceful sand pipe, and Hat Shop, a small group of hoodoos; the one-way trip to these is one mile. Further away are Panorama Point, a little hill that overlooks all of the park and has sweeping views across the Paria River valley towards Bryce Canyon, and Secret Passage, a short, narrow drainage - round trip for these is 3.8 miles. The most distant part of the trail leads to another big sand pipe (Mammoth Geyser) and then a cliff-lined basin, past several narrow, shady ravines, one known as Cool Cave. 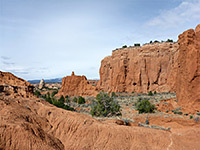 The elevation gain along all of the trail is minimal, with just a few short descents into dry washes, and about half is over open flats, while the other half (the northern section), runs beneath the red and white sandstone cliffs that stretch right across the park. 21 views along the Panorama Trail. The Panorama Trail starts half a mile beyond the state park entrance station, just past a horse rental center. The parking area is shared with the Grand Parade Trail, on the opposite (east) side of the road. 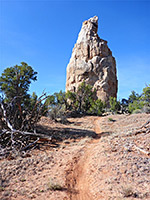 The Panorama Trail starts by crossing a dusty ravine, which occasionally contains flowing water, then proceeds west over level, sandy terrain, to the first junction, at the start of the loop section; this is at the southern tip of a line of cliffs, near a few red pinnacles. Anticlockwise is the recommended direction, and the right fork soon reaches the first two attractions of Ballerina Spire and Hat Shop, but if walking the full loop, the other way is better, since the least interesting stretch, nearly a mile across bushy flats passing no rock formations, is done first, and hence the left fork is preferred. This path moves away across open, featureless land, heading southwest, aiming towards a gap between two red buttes. The trail crosses a drainage in the middle of the flats and rises slightly past scattered pinyon and juniper pines, to a second junction; right is the continuation of the loop while left is a 0.3 mile spur to Panorama Point. This goes through the gap between the red cliffs, over some little mounds and round a white butte to the overlook, the highest point of the hike. The views extend west to the Paunsaugunt Plateau and south to the White Cliffs around the Paria River, as well as north over all the state park. There are several other little summits ahead, and a faint path goes a short distance further. From the second junction, a short walk north reaches another intersection, around which are several groups of sclerocactus parviflorus cacti, and scattered wildflowers; in spring the most noticeable are several species of astragalus and cryptantha. The right branch of the trail is a link to the north side of the loop, while left is the main route, heading towards a isolated, stout, white sand pipe (Mammoth Geyser), beyond which the path bends back northwards to the next junction, at the base of the main line of cliffs. The following segment, keeping left, rises slightly over a low ridge and descends into a basin, lined by cliffs on three sides, and onto the final junction, at the start of a 0.6 mile loop all around the base of the cliffs. 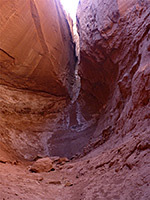 Staying left, the path crosses a drainage and leads to a little spur - along a tributary wash into an enclosed canyon, which ends at a circular, echoey, red rock chamber beneath a dryfall from a slot canyon above, a feature known as Cool Cave. Beyond the cave, the path crosses the main drainage a second time and passes several other very short ravines below dryfalls, before arriving back at the fifth junction and then the fourth, where the loop continues by turning left, straightening and staying close to the cliffs, which are now higher, and not broken by little canyons. The penultimate intersection is with the link path from Panorama Point, just after which is the final junction, with a very short loop to Secret Passage, a little shallow slot; not so interesting but near a photogenic group of smooth sided, tepee-like like cones. 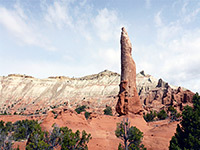 At the cones, it is 1.1 miles back to the first intersection, nearest the trailhead - across an area of mud hills and washes, while moving further away from the cliffs, which are now mostly white rather than red, and over sandy ground to the Hat Shop, a small collection of caprocks on tall, narrow pedestals - less impressive than many similar areas in the Southwest such as the identically named region of Bryce Canyon. The last part of the loop runs due south past another slender pinnacle (Ballerina Spire), and along the side of a red ridge. One additional feature hereabouts is Indian Cave, an alcove where the rocks are covered with dozens of hand-like markings.